Is this a migraine or a sinus headache? You feel the familiar throb of a headache beginning and just like that your day is ruined. Everyone gets a headache from time to time, and they can vary tremendously in severity to disrupt your life. It’s important to know the type of headache you have so that you can treat it properly. It’s easy to confuse a migraine and sinus headache, but there are differences. Your sinuses are air-filled spaces inside your forehead, cheekbones, and behind the bridge of your nose. When they’re inflamed, it’s usually from an allergic reaction or infection. These conditions make your sinuses swell, creating more mucus, and causing blockage in the drainage channels. The build up of the pressure in your sinuses causes the pain that feels like a headache. A migraine on the other hand, feels similar but happens suddenly, without warning. A migraine may be steady or abrupt and varies in intensity. It may be provoked by illnesses that affect your head or neck, like a dental problem. It often subsides after a few hours with the help of OTC (over-the-counter) medication. Pain in your head and particularly your forehead. Sensitivity to sound or light. Severe throbbing on one side of your head. Read Why do I get motion sickness? Preventative medication to prevent migraines. Triptans to constrict blood vessels to block pain pathways in your brain. Relieve emotional stress. Unwind and step away from stressful situations when you can. Learn how to calm yourself with deep breathing. Minimise physical stress. Get proper rest and sleep every day. If you sit for long stretches, get up and move around often. Relax your jaw, neck, and shoulders. Exercise regularly. Try to exercise for at least 30 minutes a day. Stick to a routine. Eat your meals and snacks at about the same times during the day. Go to bed and wake up on a set schedule. Know your triggers. Keep a diary to learn what sets off your headaches. Avoid these things when possible. Practise prevention. 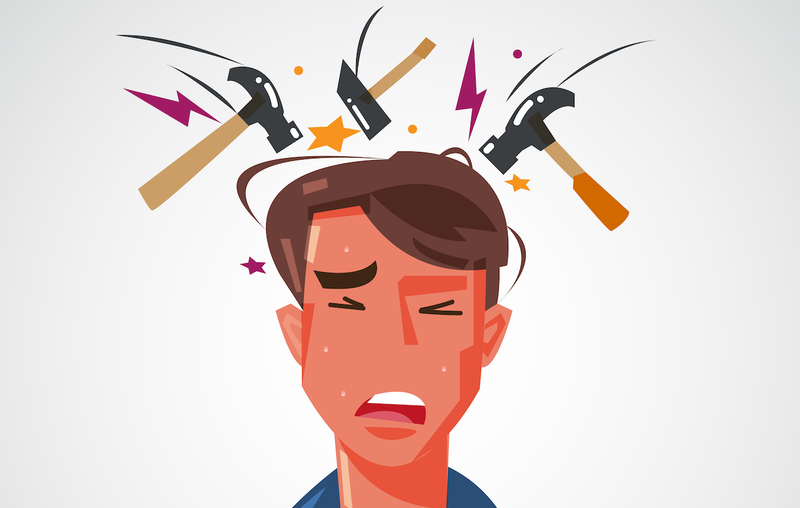 Once you know your triggers, take preventative medication to stop a headache in its tracks.